Track is my field: Mark Cullen's international track and field website featuring storytelling, commentary, and predictions and event analyses for the Olympics and World Championships. I'm active on Facebook and Twitter: @trackerati. A near-legendary bet-settling downhill 3:46 mile at 2:00 am on a Berkeley, CA, street. Who else would run that but David Torrence? The Olympian and middle distance star, known not only for his remarkable talent but for the effervescent spirit he brought to his craft, died in Scottsdale, AZ, Monday morning. Torrence was 31. The fun and joy that characterized his approach to track and field brought him some serious results. He sported outdoor bests of 1:45.14, 3:33.23, 3:52.01 and 13:16.53. In less than a month in 2014, Torrence set the indoor world on fire when he set an individual American record and a relay team world record. His finest individual performance was his indoor 1000m of 2:16.76, = #10 on the all-time world list and still the American record, set on February 8, 2014, in Boston. He was also a member of the indoor world-record setting 4x800m relay team dubbed the "US All-Stars" - all-stars indeed, as their 7:13.11 still stands as the world record. This was set 22 days after his 1000m record, also in Boston. Torrence ran the second leg of the 4x800m relay. Richard Jones led off in 1:51.0, Torrence followed in 1:47.46, Duane Solomon was next in 1:47.98, and Erik Sowinski anchored the world record in 1:46.66. Torrence ran for his mother's native Peru in the 2016 Rio Olympic Games and finished 15th in the 5,000m final. Just 8 days ago, he placed fourth in the Emsley Carr Mile at the Birmingham Diamond League Meet in 3:56.10. Torrence was noted for his courageous stand against doping and for speaking truth to power when it came to speaking with authorities about his brief but deeply uncomfortable relationship with Coach Jama Aden's training group. 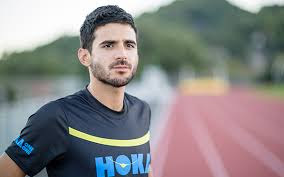 We share in the profound sense of loss of David Torrence and send our deepest sympathy and condolences to his family and his many, many friends in the track and field world. "Hard work doesn't guarantee success... but it sure as hell gets your foot in the door. It's race day, and it's time to fly." I am so sorry to hear about David Torrence.He was indeed a legendary racer.So much talented and extra ordinary player he was,he died at very young age!! Very solid article. As a long time track geek, I look forward to reading your content! I am always searching online for articles that can help me. There is obviously a lot to know about this. I get to you a new game. This is hot games in the year– sims 4 cheats Click link to visit site. Creative Course Construction - imagine running downhill into this corner - "The Berm" - Senior racers will do so 5 times! Click on photo for article "Mondo Mania"
I'm active on Facebook and Twitter. Hey fellas, why the long faces?! © 2015 Mark Cullen, All Rights Reserved. Picture Window theme. Theme images by nico_blue. Powered by Blogger.